Who do you think you are?!? 1) Go to transaction SQVI: In the section ‘Quickviews for …’ you may see some prepared reports already. Since you are new to this it is likely to be empty. 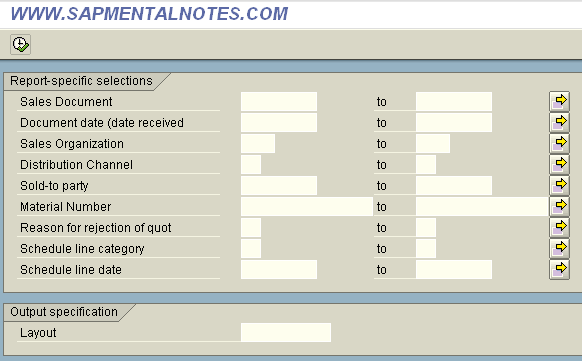 Since we are going to create a new report enter a name for the report in the Quickview name field and press < Create>. 2) In the selection window enter descriptions and choose ‘Table join’ as ‘Data source’. This means we are going to connect and use multiple tables. Press <Enter> to continue. 3) In the screen ‘Choose data source’ press the ‘Insert table’ button. In the window that pops up enter the name of the table that you need. 5) Press ‘F3’ to go to the configuration screen. In the left side of the screen you can select per table which fields are for selection and/or list purpose. E.g. if you only select a field as ‘List field’ it will show up in the report results, but will not appear in the selection screen of the report as a filter criterium. For the header I choose: document number, doc date, sales organization, distribution channel and sold-to party (all list and selection). On item level I select: Material Number and Reason for rejection (to be able to exclude rejected lines). Both List and Selection. For Schedule I pick: Item, Schedule Line, Schedule line category, Schedule line date and Confirmed qty. Only Schedule line category and date both List and Selection. The others only List. Now your screen will look like below. 6) Now it’s time to test drive your report! Press <Execute>. It takes a short time for SAP to build te report. You are taken to the selection screen of the report. Now it is important that you have an idea of what data you are going to find. Enter filter criteria based on this idea. I mention this because you need to validate the data you will be presented in the report. Do not just accept the quantities. Analyze the results and if the numbers are off find out why and adjust your report’s filter criteria and/or add extra filters to remove redundant data. 7) If you are satisfied with the quality of the report save it for future use. It is possible to link it to a transaction code and make it accesible for users through authorization. I will post a guide on this in the future. This entry was posted in Basis and tagged Basis, reporting on January 23, 2009 by mensenjh. It is a matter of knowing what tables to use. I cannot tell you based on the information you give me whether you can link through to tables that contain material data. My organization is refusing to provide production access to SQVI on the grounds that it could take down porduciton system if a “wide Open” query was created with this tool. Is there any merit to these claims of danger? Just used your documentation to create a list of user names and e-mail addresses of those users with a given role. i tried your method but at configuration screen, the available fields for selection shows the the name of the quickview & not the fields from the table. did i miss a step? When are you posting how to link the reports to a transaction? I would like to know the limitations that we have with the SQVI over normal ABAP report. Based on my past experience, in ABAP Query, I know that you could add your own custom field and have a brief logic to determine/ calculate the value of the custom field. thank you very much for your information. but i also want to know the rule of the table linking. hope you can recommend and appreciate. Good. step by step explanation. I wanted to know who are all dont have emaild id in su01. but when there is no data maintained for specific user(for eg: email not maintained in su01) and executing out put for username,email: it wont give any output even No record itself for email not maintained user. To link tables there should be common primary or secondary keys. For example Material No or Customer No. Interestingly you can link a Custom T-code to a SQVI Query program. please tell me how to pull data for user profiles. How to filter the data, like i have field vbrk-fksto ‘X’. i.e cancel data should not come.. Very nice post…clear discription and to the point. This is great! Can you also provide a quick guide on SQ00, SQ01, SQ02? Thanks Very Much for this information. 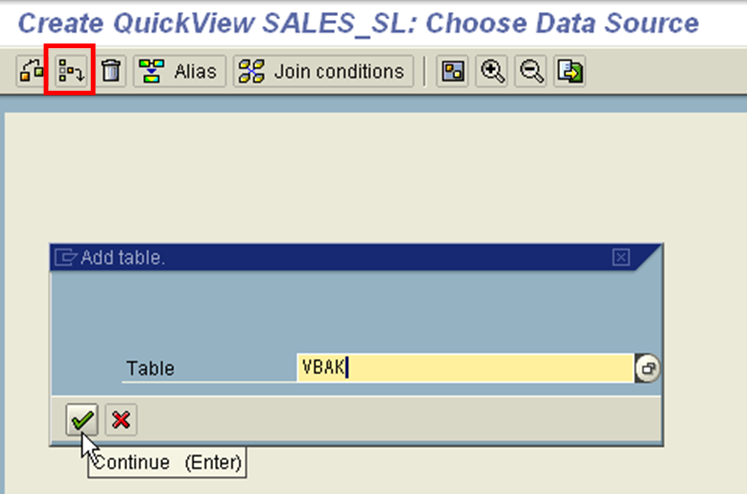 We have had SAP for a few years and using SQVI was my first venture into performing a ‘quick query’ using joined tables. This post saved me a number of hours–Thanks Again!! To convert a QuickView to a Query, proceed as follows: SQ01/Choose Change user gruop. Select user group you want./Chose Query -> Convert QuickView. i have a problem to display data in query.example: i have vendor data, a few vendor have VAT Registration and few vendor have not VAT registration.when i make query on SQVI, data just display few vendor with VAT registration, and vendor have not VAT registration, cannot be displayed. did i do something wrong? please help me to solving. 1. [SQVI] -> menu “QuickView” -> “Additional Functions” -> “Display report name”, e.g. “AQTGSYSTQV000036ZSD_VBAK======”. 2. [SE93] -> create Tcode -> Start object “Program and selection screen (report transaction)”. We need the below information, thanks. I need some help in creating SAP Query report using SQVI. The report that I need to create is Who approved the PO, Approve ID and Name, Date PO release/Approved. I have try to link table EKKO, EKPO but there is no infor related to Who approved the PO, Approve ID and Name, Date PO release/Approved. What is the table that have all the above info.